Get medals to improve your deck load-out. 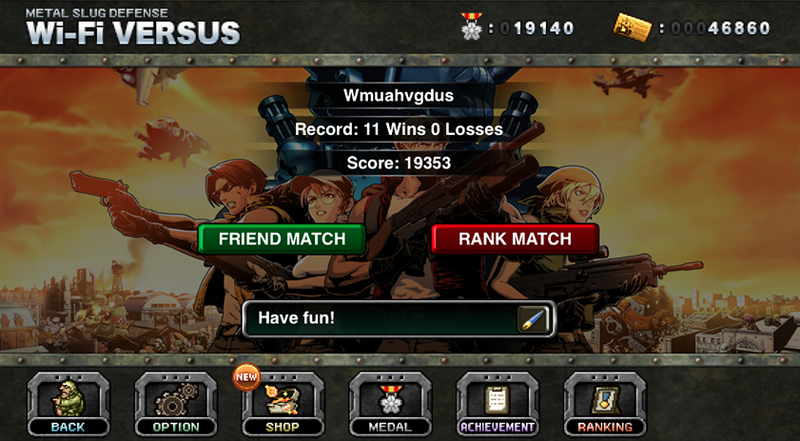 Hopefully you've read our tips and strategies on how to unlock P.O.W.s in Metal Slug Defense. If not make sure you visit our How To Unlock P.O.W.s guide as it will help you build your deck to challenge tougher opponents for medals. Unlocking Medals will enable you to buy Metal Slug Points, Radar to aid you in freeing POWs and specialized Units for further deck customizations. This guide will give you a few tips and strategies for unlocking medals within the game. How do I Unlock Medals in Metal Slug Defense? There are three ways you can unlock medals in MSD. You can purchase them at the medal shop at various increments from 30 medals of $0.99 to 3,900 medals for $99.99. Another way is to earn them in combat via MSD WiFi VS Ranked Matches. The easiest way to earn medals, is to login to MSD daily. You'll earn a daily reward which could be a medal, it depends on how often you login. The more you login regularly the better the rewards. How do I get the most medals in Metal Slug Defense? You can earn more medals by challenging tougher opponents in ranked matches. Selecting your level of difficulty within the Wi-Fi Versus screen will raise the reward. Starting from "Have fun!" to "Not done yet! ", you can challenge tougher opponents for more medals. Selecting the best opponent to challenge is very important to winning medals. You want to choose opponents that have similar troops within their deck. Going up against a more powerful deck will earn you nothing but disappointment. Choose someone on your level so you have a fighting chance of winning. How should I spend medals in Metal Slug Defense? You've won a few ranked matches and you've acquired a nice nest egg of medals. How should you spend them? Go to the shop and buy more units. The specialized units within the shop will help you win more ranked matches. These units have fast production rates to make quick work of your ranked opponents. Choose units that fit your particular fighting style. You now have a few tips and strategies for unlocking medals in MSD. Review our guide on How to Choose the Best Units. It will give you some tips and strategies for unit selection to earn more medals.